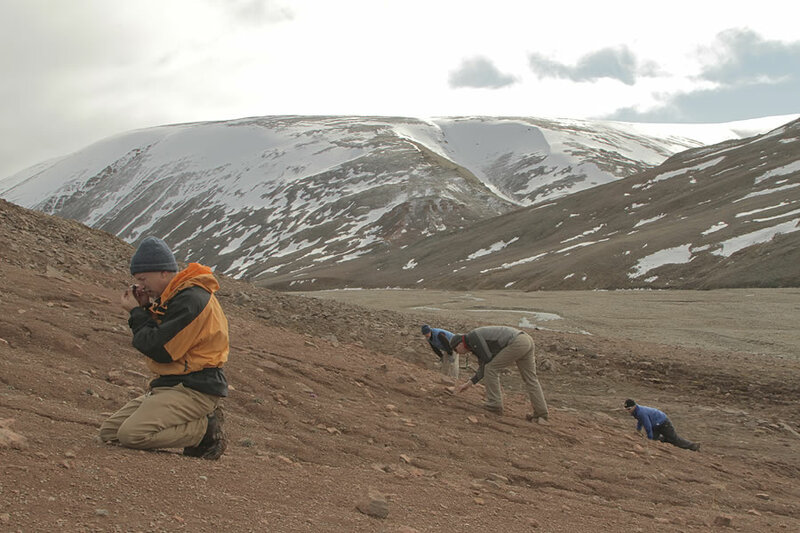 From the left, Ted Daeschler, Neil Shubin, Josh Miller and Marcus Davis scour the landscape of Canada’s Ellesmere Island for vertebrate fossils. 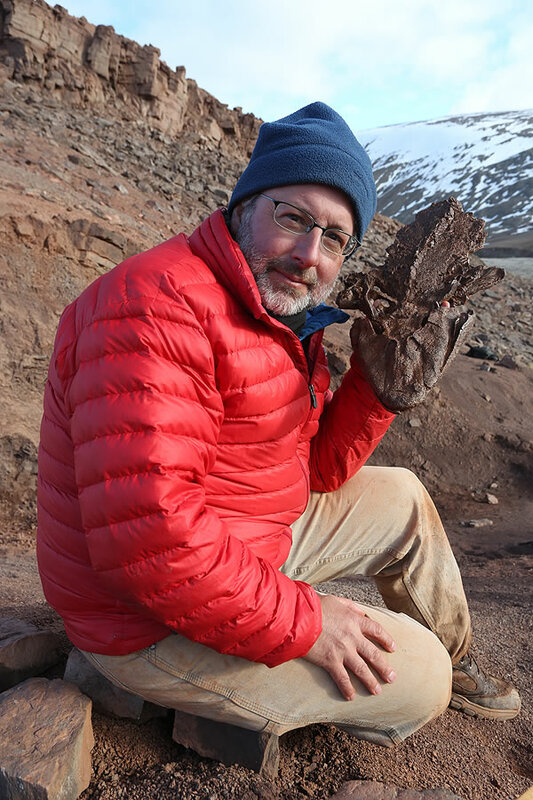 Neil Shubin holds a cast of a fossilized fish with limbs, Tiktaalik roseae, near where the remains of the transitional tetrapod were discovered. 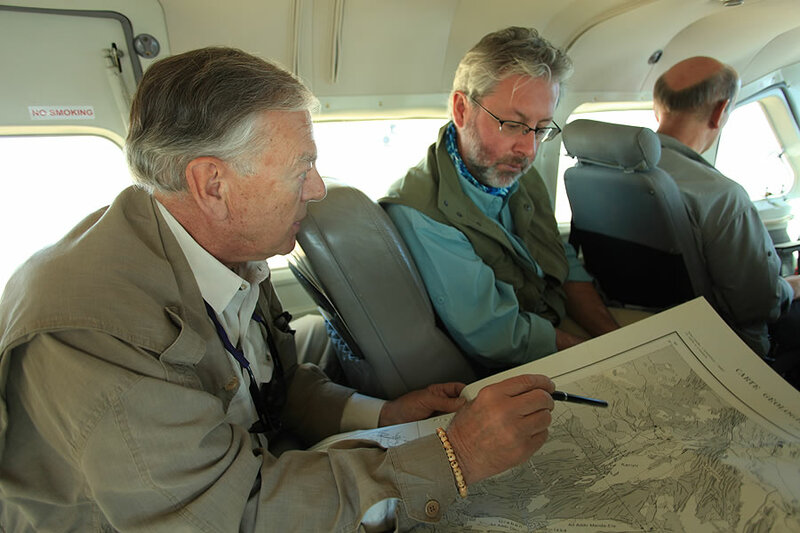 In the Karoo Basin of South Africa, Roger Smith, left, and Neil Shubin inspect a fossil of gorgonopsid, a predator from the Permian period. 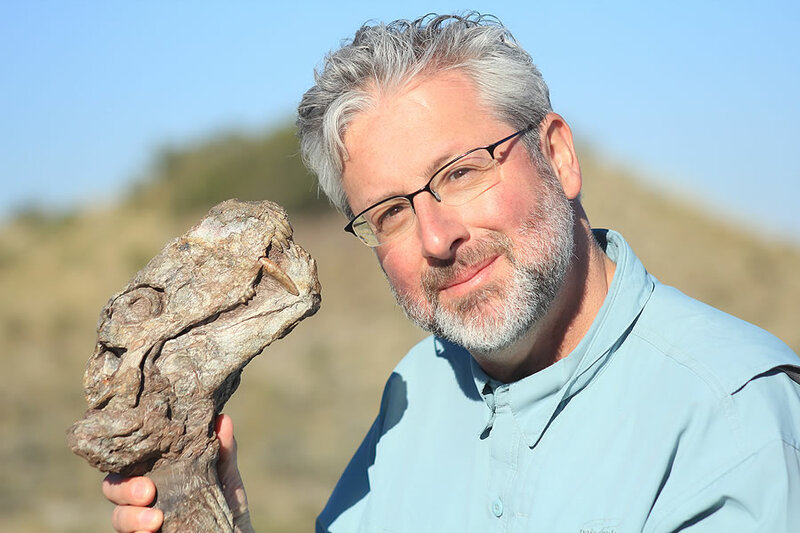 Neil Shubin communes with Thrinaxodon, a reptile-like mammal that’s been found inside burrows very similar to ones built by modern burrowing rodents. 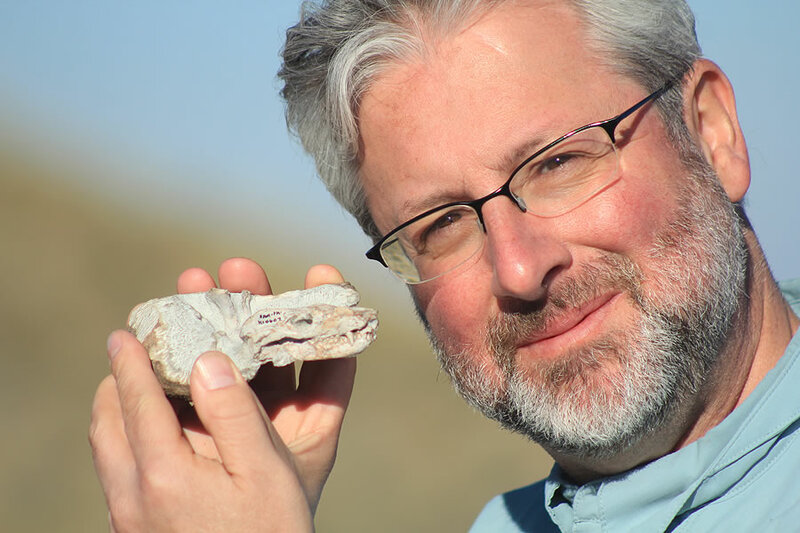 Neil Shubin holds a fossil of gorgonopsid, a reptile-like mammal that was beginning to show specialized teeth like those of modern-day mammals. 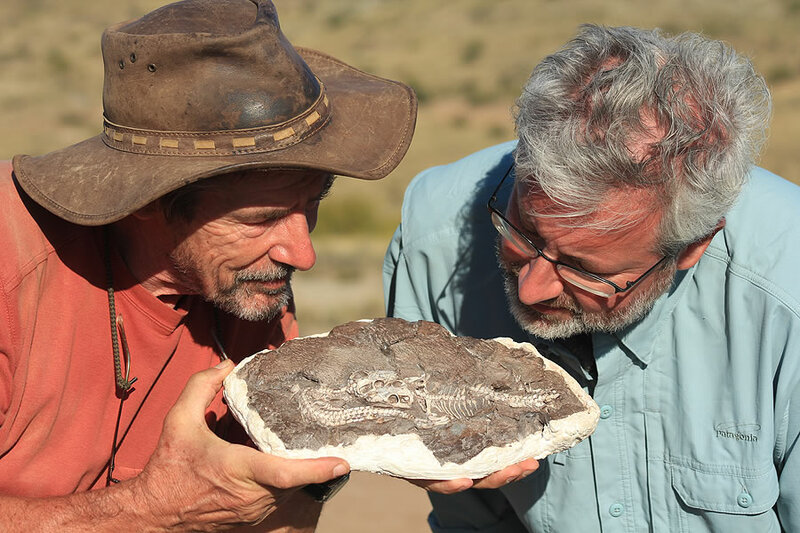 Roger Smith, left, and Neil Shubin examine a fossil of two juvenile Thrinaxodon — mammal-like reptiles that survived the Permian extinction. 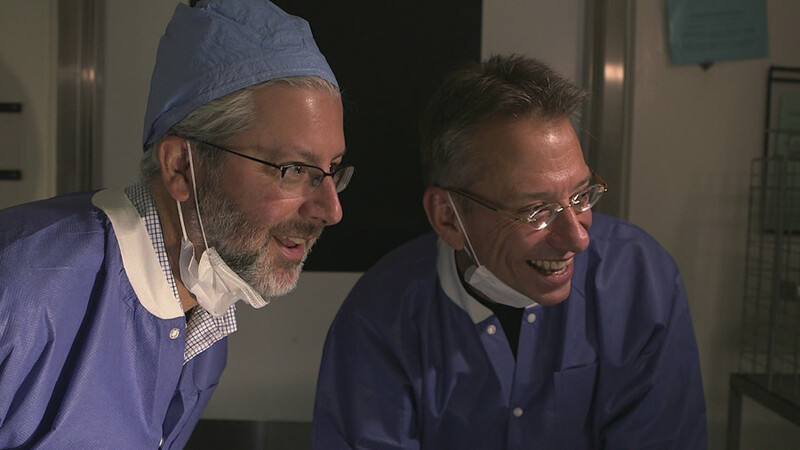 Michael Berryman, left, and Neil Shubin look at some fossils that shed light on the evolutionary origin of conditions known as ectodermal dysplasias. 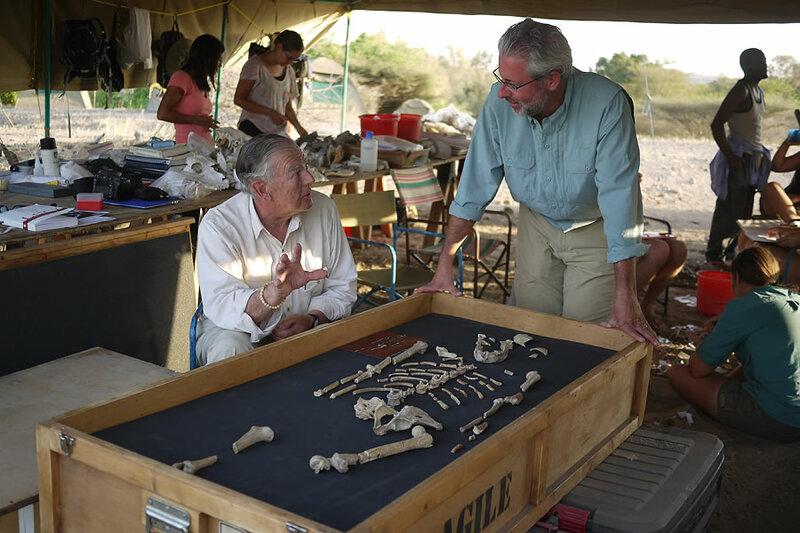 Don Johanson, left, and Neil Shubin discuss the fossilized bones of “Lucy,” a 3.2-million-year-old hominid that was able to walk on two legs. 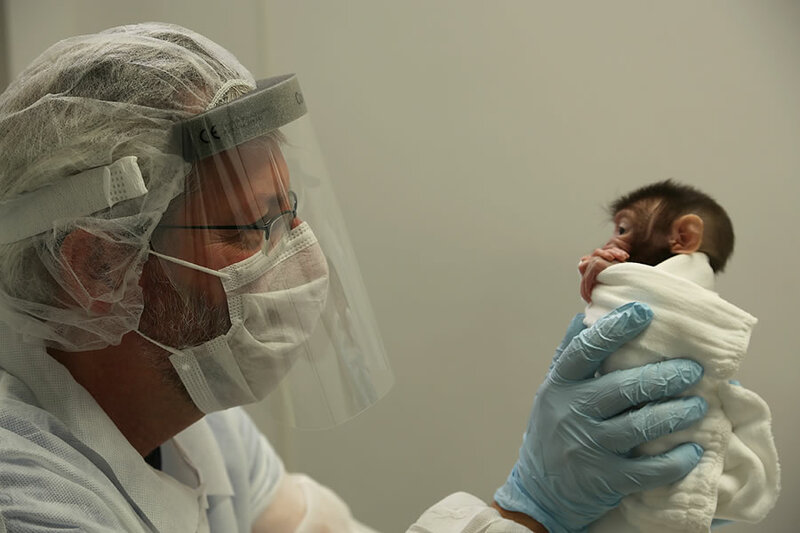 Neil Shubin holds a baby macaque monkey. Monkeys of the Macaca genus are used to study brain development in primates — including humans. 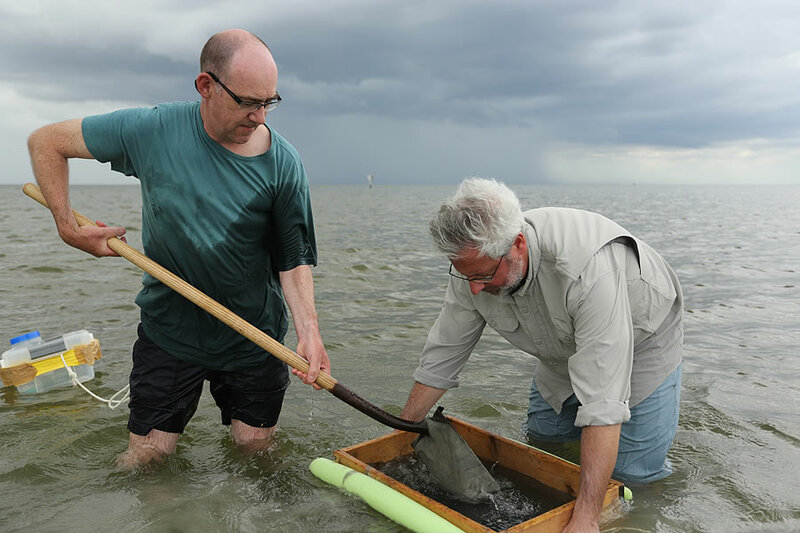 Peter Holland, left, and Neil Shubin hunt off the Florida coast for amphioxus, a wormlike creature used to study the origins of basic human features. 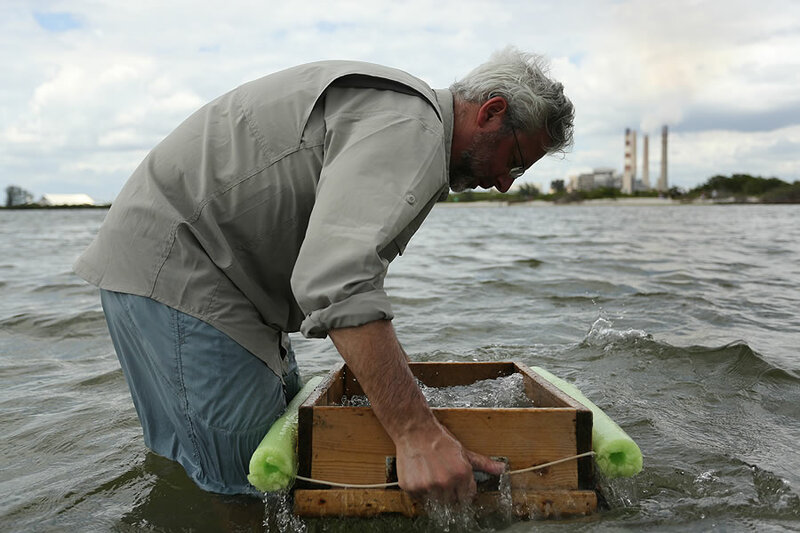 Neil Shubin sifts sand to look for amphioxi, wormlike creatures that provide evidence for how our brains evolved half a billion years ago. 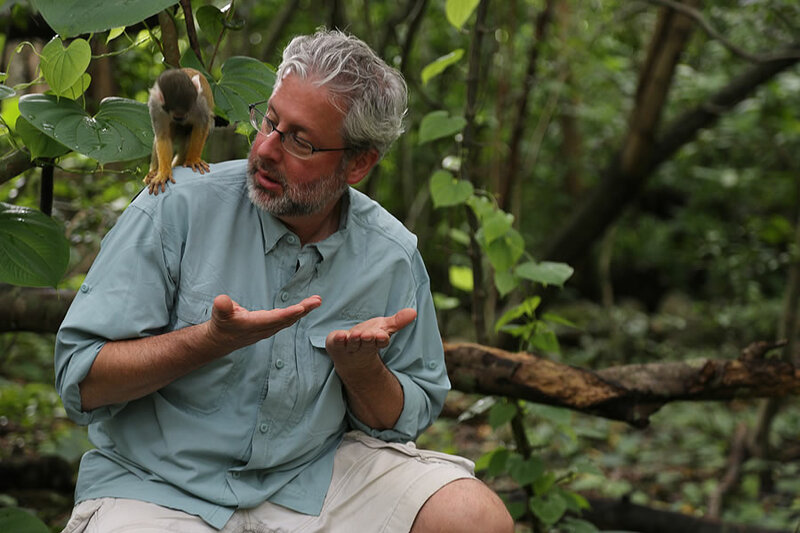 Neil Shubin gets up close and personal with a tiny squirrel monkey at Monkey Jungle in Miami, Fla.
Neil Shubin interacts with a squirrel monkey; our many shared features are evidence of a common ancestor that lived relatively recently. 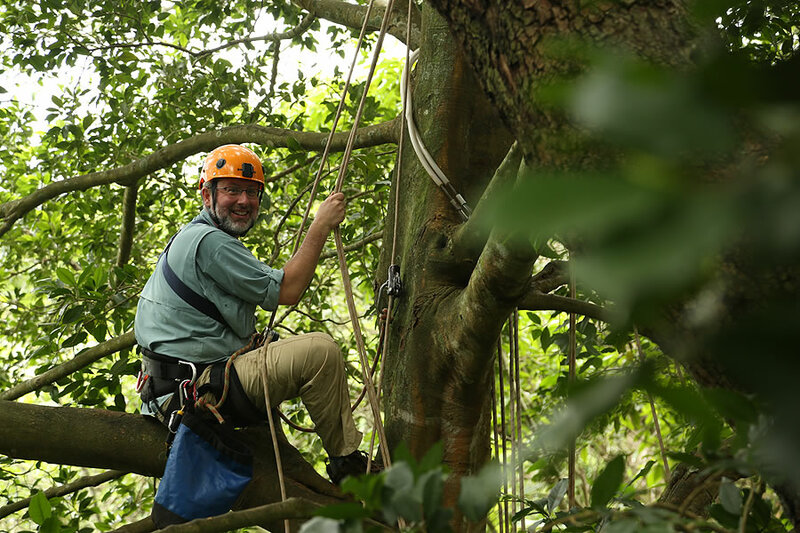 Neil Shubin perches in a tree to get a close look at what’s known as the fine branch niche, where our ancient primate ancestors used to live. 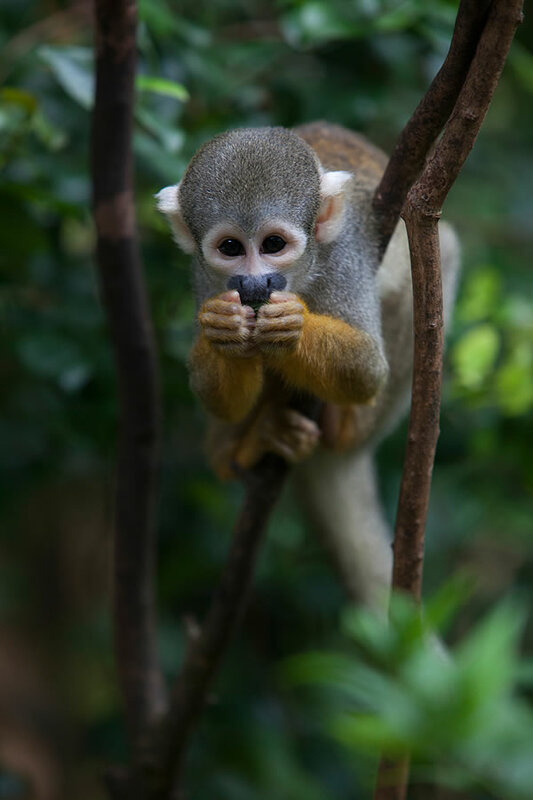 Small primates — like this squirrel monkey shown perching in a tree — use their long fingers and opposable digits to move agilely among the branches. 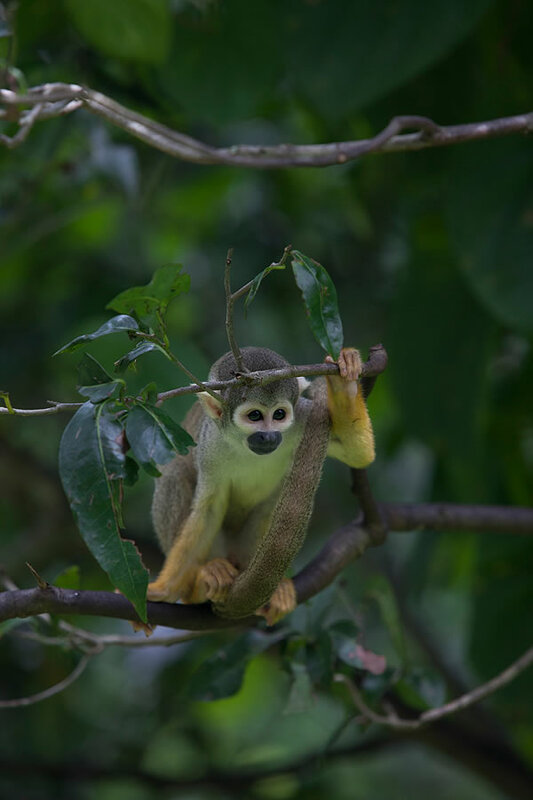 This squirrel monkey chows down while perched in what’s called the fine branch niche, home to flowers, fruit, and insects — and our primate ancestors. 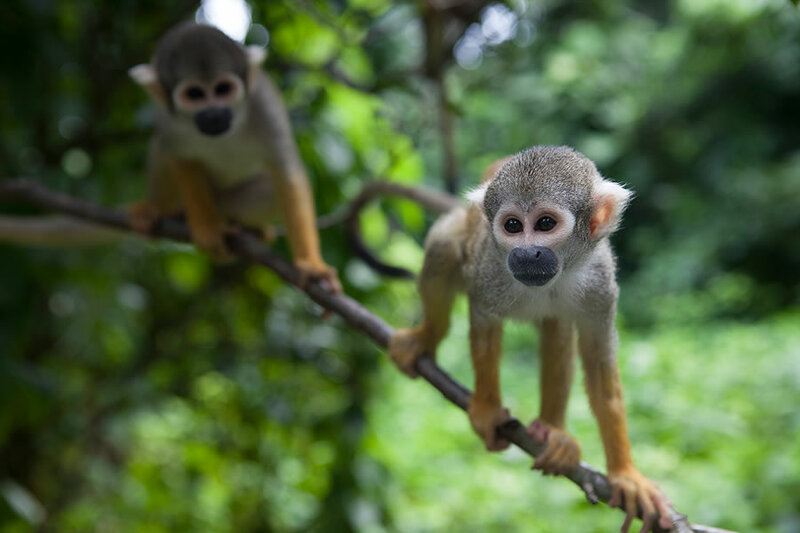 As these squirrel monkeys scurry around in the treetops, the shape of their hands allows them to reach food hanging from the tips of the branches. 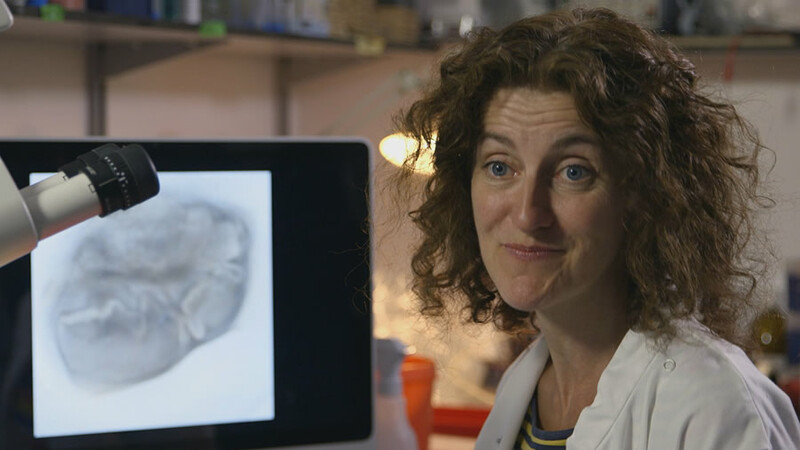 Abigail Tucker, a developmental biologist, studies the way that hair, teeth and scales form during development. Evolutionary biologist Karen Sears holds a gray short-tailed opossum. 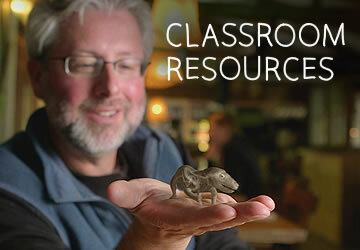 Sears investigates mammalian evolution by studying opossums and other mammals. 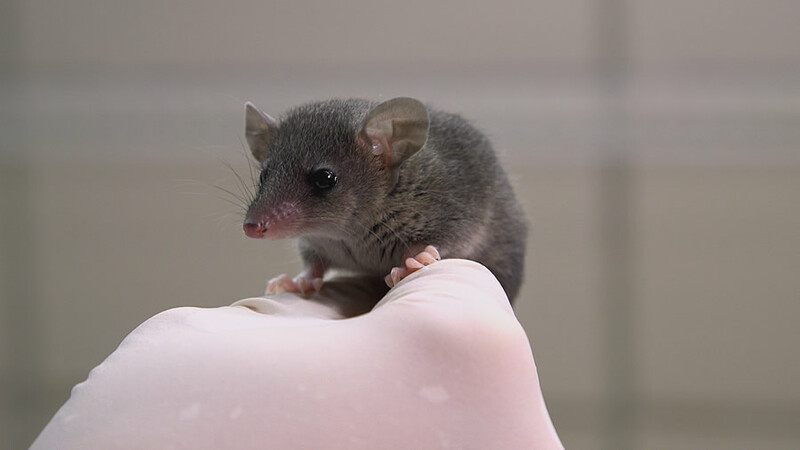 Gray short-tailed opossums have become a common lab animal in recent years. 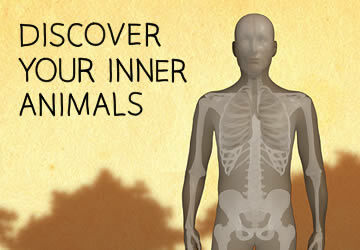 Studying animals like these can illuminate humans' evolutionary history. 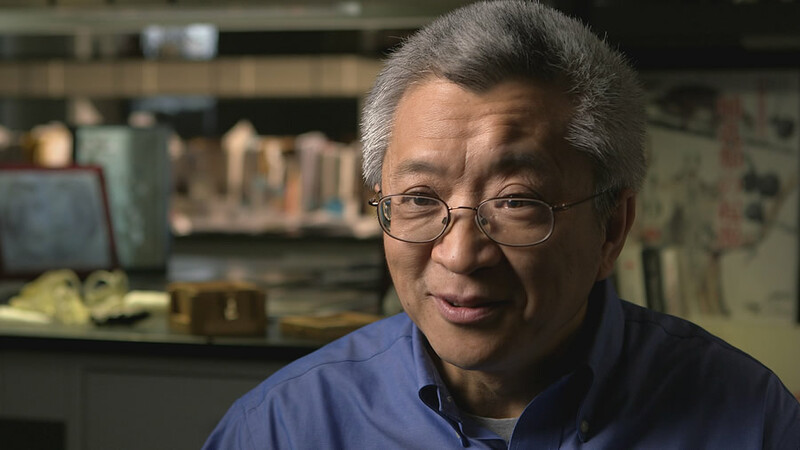 Zhe-Xi Luo, a paleontologist, studies the origin and evolution of mammals by searching for fossils that are almost 200 million years old. 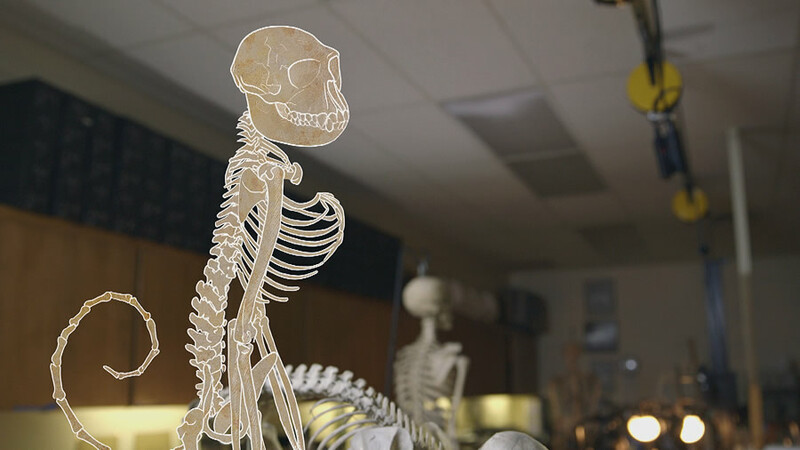 An animated primate skeleton stands awkwardly. Unlike humans, most primates are unbalanced on two legs because of the shape of their backs. 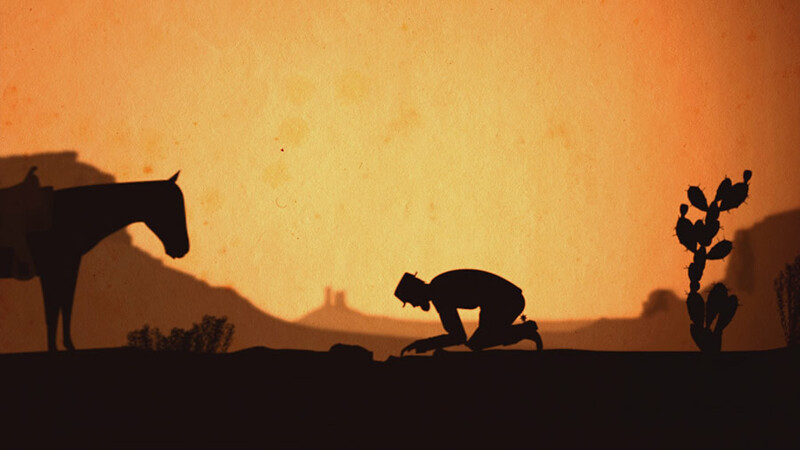 This illustration depicts Ferdinand Hayden digging for fossils in Wyoming; he was the first person to discover the ancient primate Notharctus. 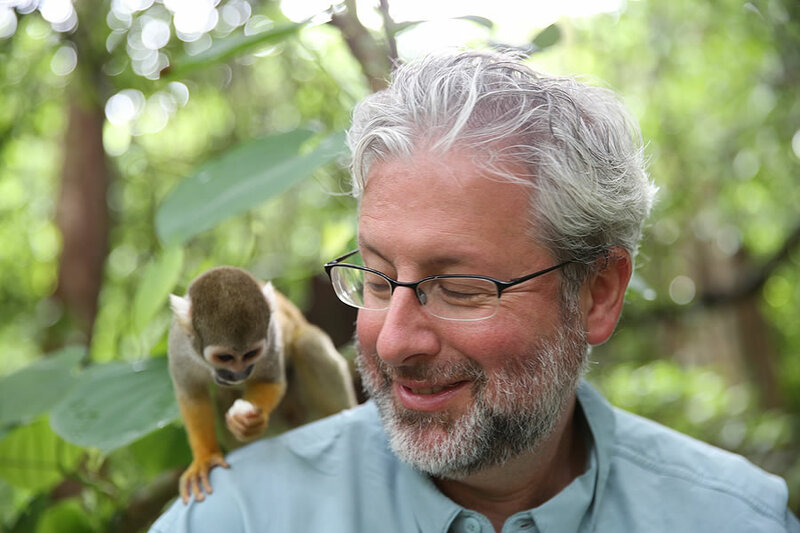 Neil Shubin and Jay Neitz watch a squirrel monkey take a color vision test. Neitz studies the way that different species of animals see color. 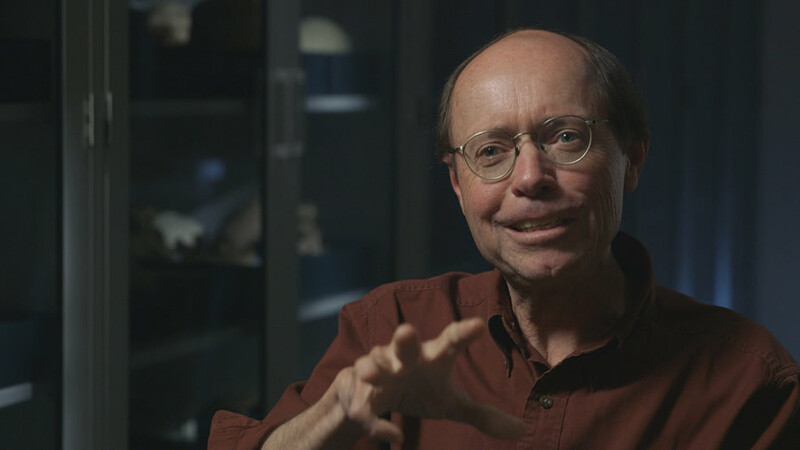 Paleontologist Tim White is on the team that found "Ardi," a specimen of a hominid species that has reshaped our understanding of human evolution. 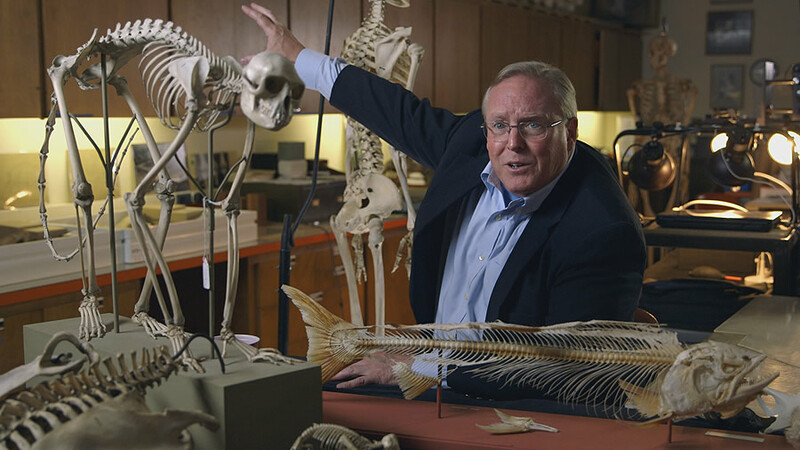 Bruce Latimer, a physical anthropologist, studies human origins and the impact of human evolutionary history on our bodies today. 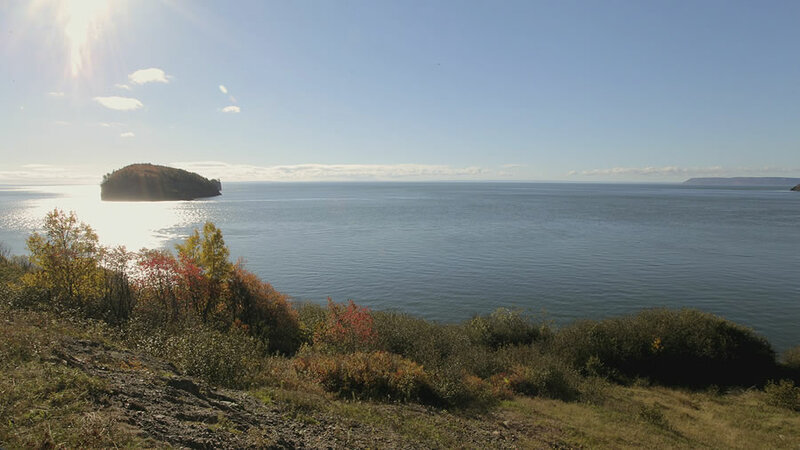 The Bay of Fundy in Nova Scotia is home to the largest tides in the world. Movement of water against the cliffs causes erosion, exposing new fossils. 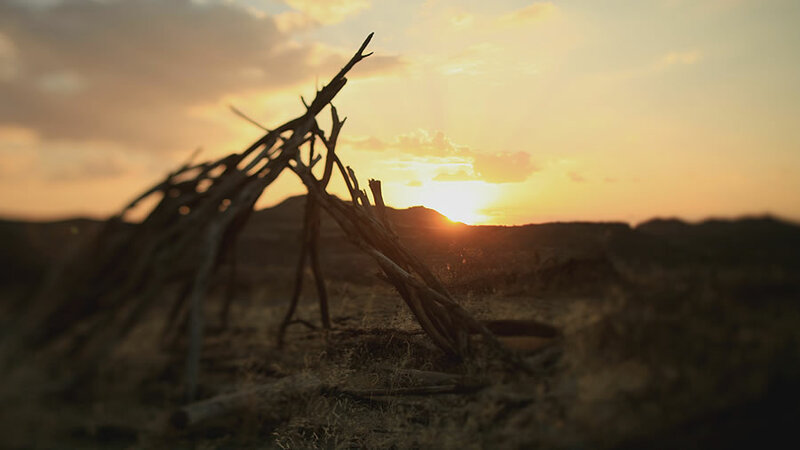 The sun rises over the badlands of Ethiopia. This desert region is home to some of the most important hominid fossils ever found, including "Lucy." 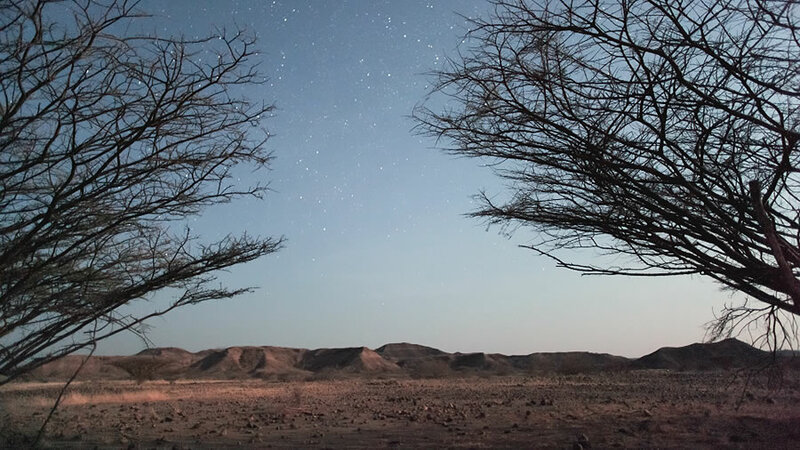 The stars shine over the Karoo Desert in South Africa. 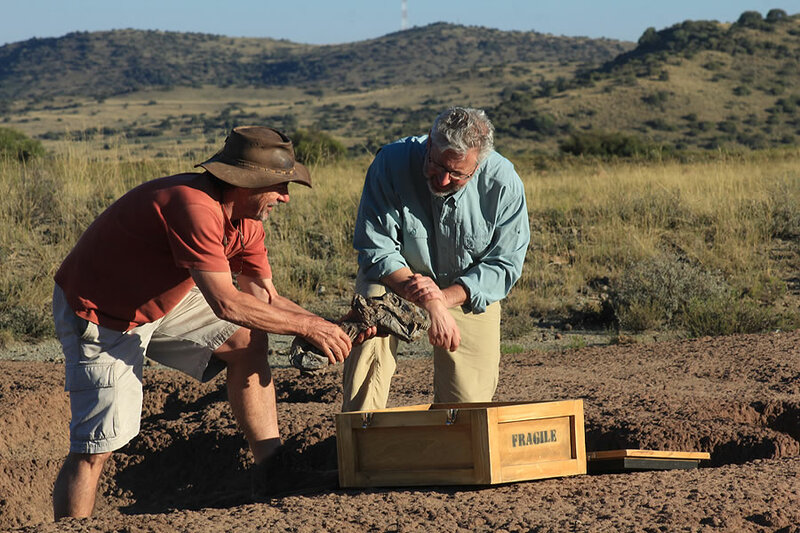 The rocks in the Karoo hold fossils that shed light on early mammal evolution. 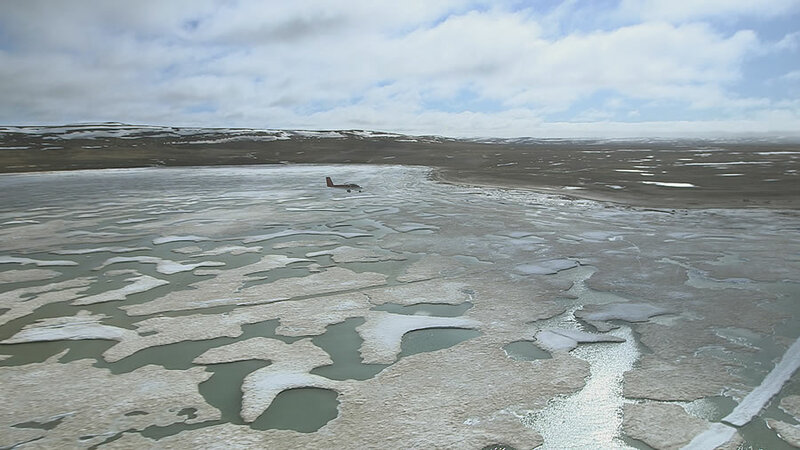 A plane approaches Ellesmere Island in northern Canada. 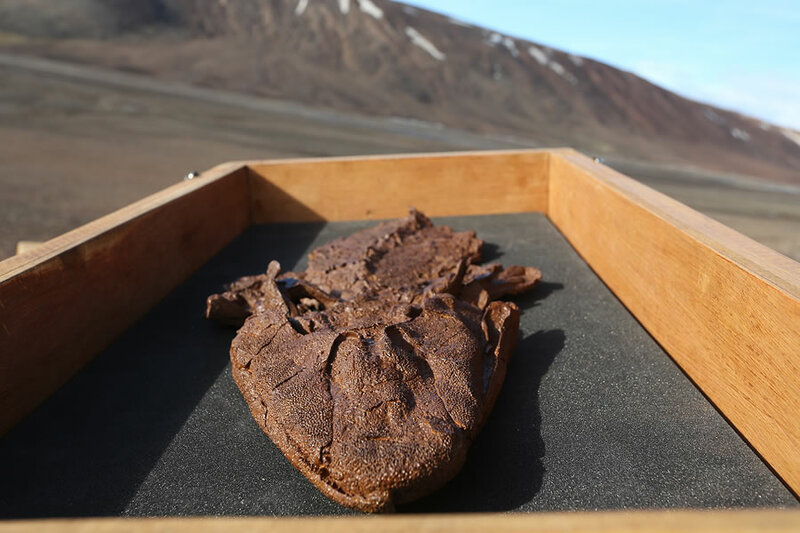 Fossils found here have increased our understanding of the evolution of tetrapods.